Are you looking for a morning pick-me-up, or an afternoon of relaxation? Whatever your preference, we have a fine selection of locally sourced organic and certified free trade coffee from One More Cup (Seabrook, NH), and organic teas from White Heron Tea & Coffee (Portsmouth, NH). One More CupR is a New Hampshire owned and operated company. If you are looking for a great cup of "joe" for a fundraiser, they've got you covered. Follow them on social media or give them a shout. 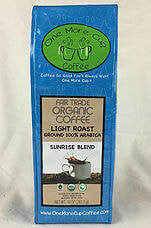 Sunrise Blend - a perfect way to start your day with this great blend. The flavor is light and crisp, sure to leave you wanting One More Cup®. Sunset Blend - a bold yet very smooth darker roast. Full of flavor sure to please your taste buds with a blend from all the best growing regions. Mountain Spring Organic Decaf - the Swiss Water® process gives you the full flavor. 99.99% caffeine free and 100% fabulous. Enjoy a great cup of coffee any time of the day. Established in 2005, White Heron is a New England based organic tea and coffee company. Beginning with the intention of offering divine and healthy organic teas, within a few years, they expanded to offer fresh brewed teas and coffees and added a bright and airy Cafe where folks can wander in for handmade English Muffins, baked goods, breakfast, lunch and more. Follow their blog HERE, and follow them on their social media sites. Delicious English Breakfast style blend of Organic Assam & Darjeeling teas. A robust cup, the malty richness of Assam black tea paired with the nutty astringency of Darjeeling. A White Heron favorite! Classic African Rooibos with a smooth coconut flavor. Classic Indian black masala chai... spicy and delicious. A blend of organic Assam CTC leaves with cinnamon, cloves, ginger and fennel seed. Organic Swiss Water Process Decaffeinated India Black tea. The secret to getting a full flavored cup with loose decaffeinated black or green tea is to: 1) Use a pinch more tea than normal. 2) Brew with very hot water 3) Brew an extra minute or so. Water Process decaffeinated tea has caffeine extracted through hydration, caffeine capture, then drying. At the close of the process, trace amounts of caffeine may exist, and a hint of the original flavor removed, thus the recommendation for a bit more tea and brew time! Organic USA grown blend of peppermint and spearmint. Minty and refreshing. Get fresh with Mintology! Organic China green tea blended with USA grown organic spearmint. A great hot or iced tea! A tasty blend of India black tea with orange peel and spicy cinnamon. Organic rose buds with peachy osmanthus flowers, lemongrass, lemon balm and lemon verbena. Fragrant and relaxing. Caffeine free. Somehow, Winter Warmer Chai has become popular year round, but we never bothered renaming it. A blend of Organic India black tea with masala spices & sweet orange. A blend of India and China black teas that offers a full flavor cup. Notes of chocolate and pine smoke. Historically, horse and camel caravans would spend sixteen months making the round trip journey to Eastern China, arriving in the Russian capital laden with chests of tea. The leaves aged a bit along the way; absorbing wafts of pine fire. The taste of camping at home! Tasty lemon verbena blended with red clover tops. Has a light floral sweetness with notes of minerals.